The MagniLink S (MLS-CM03) is a portable, Mac compatible, HD/OCR video magnifier that provides superior picture quality with no ghosting. It comes with the latest technology for superior image quality and is easy and fast to connect to a computer or directly to a monitor. Plus, it can even read text out loud! The camera has superior picture quality with unbeatable sharpness, light sensitivity and viewing angle, and offers 60 digital full frames/second for an image that is extraordinarily clear – even when in motion. And, it provides between 1.4X - 75X magnification and has 7 different viewing modes. There is a free working height of 12.2” (31 cm) that makes it easy to browse through a book, binder or folder. 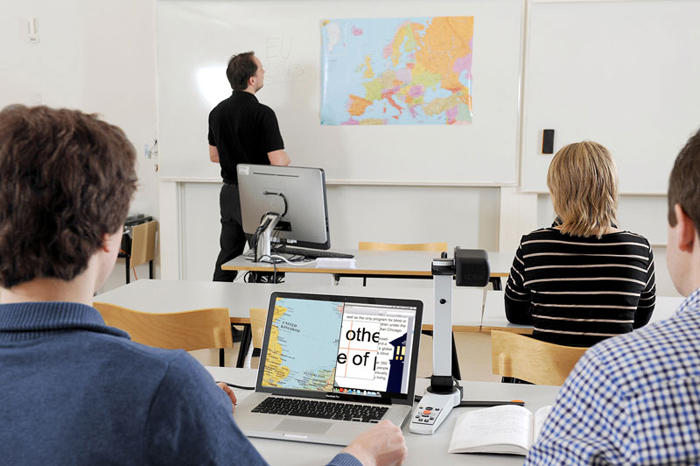 In addition, the high placement of the camera, together with the camera’s wide viewing angle of 54°, make it perfect for students in the classroom or meeting rooms in the workplace. The flexible camera head and arm rotation of 330° horizontal and 300° vertical provide easy and quick switching between distance and close-up reading tasks. The MagniLink S (MLS-CM03) is powered by a laptop computer (Windows or Mac based) through its 3.0 USB port so there is no added weight from a battery. The system is controlled via the buttons on the base or via keyboard shortcuts. And, with its OCR capability, displayed text can be viewed and heard for maximized reading speed and comfort. The MagniLink S comes complete with a smart 2-in-1 carrying case that has room for both the MagniLink S, a 15.4” laptop and its accessories. And, due to its adaptable modular design, there are 6 different MagniLink S models to choose from depending on the type of camera, connections and features that are needed. With these choices, the MagniLink S will fit the needs for most users, regardless of whether it will be used at home, school, work - or wherever you go! MagniLink S is compatible with both Windows 7 and Windows 8 operating systems.